If you love singing and would like an exciting new challenge, the Galway Choral Association would like to hear from you. Choral singing has never been so popular! The experience of singing great music as part of a large choir has never been more rewarding! The opportunity to meet like-minded music lovers has never been closer! The Galway Choral Association is a 60 strong amateur, community based choir and welcomes men and women from throughout Galway City and County who can sing and who share a commitment to working together to make great music accessible to all. The ability to read music, while an advantage, is definitely not a necessity. Aids to learning are provided and with work and dedication, anything is possible. The Galway Choral Association has planned an exciting programme of music to be performed in January next at the first of its two annual concerts. Music by Mozart, Tavener and Fauré will offer a stimulating and challenging experience for existing and new members. Parallel performances for various charities and Christmas events present fun times in aid of those in need in the city and county. Led by Choral Director, Norman Duffy, the choir rehearses each Sunday evening from 7.30 p.m. to 9.30 p.m. in St. Patrick’s Brass Band Society Hall beside Ceannt Railway Station in Galway City. Rehearsals start on Sunday September 1st and Norman promises the first evening will be an enjoyable and fun experience for all. “Galway Choral Association is a community based choir with members of all ages and differing levels of experience. We are a friendly welcoming bunch and we would love to hear from anyone who has an interest in choral singing,” says Michael O’Hare, Chairman of Galway Choral Association. 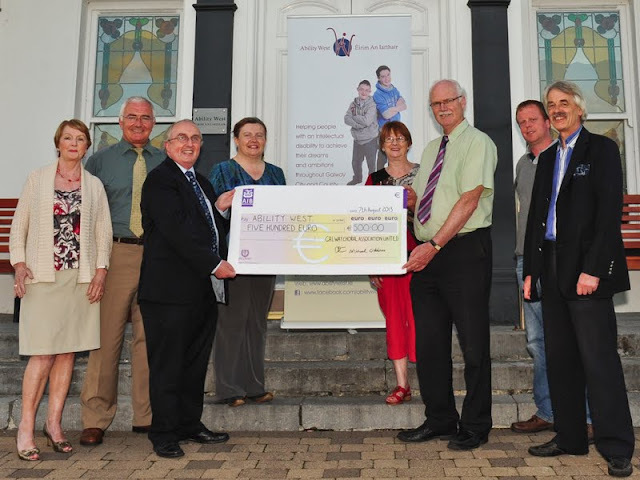 Maureen Forde, Pat O’Sullivan, Michael O’Hare, Mary Curtin, Miriam Browne, Adrian Harney, Cathal Ryan, Craig Steven from Galway Choral Association present a cheque for €500 to Adrian Harney and Cathal Ryan from Ability West. 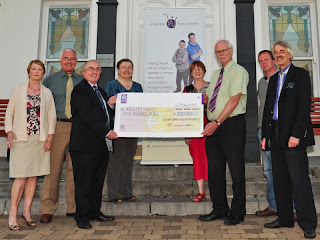 Proceeds were raised our concert on June 22nd. Photo by Boyd Challenger.